Looking to get a retaining wall installed on your property? 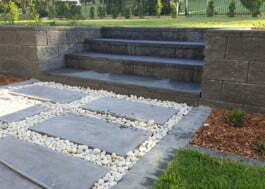 Focal Point Landscape maintenance is one of the leading experts in retaining wall installations on the Gold Coast! We can add value to your home, while ensuring the structural integrity of your backyard. Whether you’ve got a sloping backyard or just want to ensure all your soil and mulch stays put, we can help. We use products built to last and will work with the design of your backyard to get the best possible results. Essentially, retaining walls are structures built to restrain soil from descending down elevated slopes in your garden. The Gold Coast is notorious for its hilly landscapes and wild weather. If you’re having problems with soil erosion in your garden, a retaining wall is the perfect solution. Gravity walls are the most common type of retaining wall used on the Gold Coast. They are often made from heavier materials, like stones and boulders, and count on their own weight to resist the pressure of the soil. Unlike gravity walls, cantilever walls use far less material. Made from reinforced steel and mortared masonry (or cast-in-place concrete), they cantilever the load of the resisting soil—changing the angle of the pressure from horizontal to vertical. Anchored walls are commonly used when the pressure from the resisting soil is going to be too much for gravity or cantilever walls. Cables are used to pin the wall from the top and bottom, then these are driven deep and anchored into the soil behind it. This isn’t common in residential construction. It can be difficult to know which type of retaining wall is right for your garden. Let the Focal Point Landscape Maintenance team assist you with finding the perfect retaining wall for your needs. Get a quote for your garden today! Check with all the relevant authorities to ensure your new retaining wall adheres to all the necessary building codes. When picking your retaining wall materials, you need to consider its life expectancy and the amount of upkeep it will need. For instance, retaining walls made out of wood, won’t last as long as a gabion basket full of boulders. At the end of the day, you don’t want your retaining wall to be an eyesore in your backyard. In fact, the right retaining wall will give your backyard better texture and structure. Modern retaining walls can be finished with long-lasting coloured sealants or wood-grain finishes to further boost its look.